Marriage is a wonderful thing, created by God and enjoyed by so many people. But marriages take time and effort to make them work. Challenges will be present in any marriage. So we will be running a new marriage course, written by Pastor Ross & Joy Dilnot. This is a course they ran with great success when they ministered at their last church. It is for married couples young and old – because we all need to continually work on our relationship as we journey life together. The course is in two parts and attendance at both parts is essential. 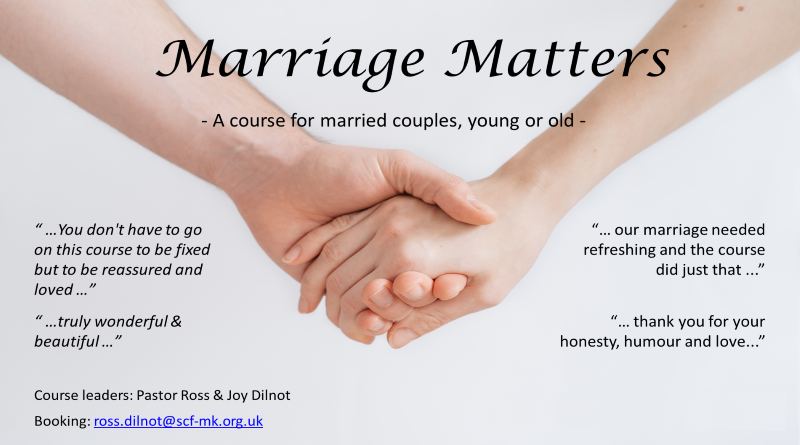 If you’d like to spend some time working on your marriage in a safe, loving and fun environment, then check back here for details of when we will next run this course.